Luton and England boxer Sam King won the Home Counties title in explosive style by beating Aylesbury ABC’s James Kerrigan at the weekend. In one of his most powerful performances to date, King went on the front foot in the first round, unleashing an array of accurate punches from every angle. King’s work-rate was so intense that Kerrigan was visibly stunned, however to his credit, he showed a lot of courage in managing to stay in the bout. If his opponent was hoping for a let up in the second and third rounds, it was not to come as King maintained the same approach throughout all three rounds and in doing so delivered a unanimous 5-0 win on the judges scorecards. 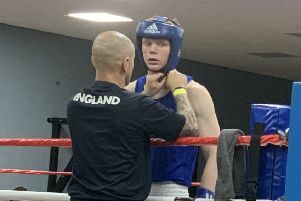 King will now represent the Home Counties on Sunday, taking on the Midlands champion in the next round of the England Boxing NABGC Championships.